As a candidate for Amherst Council District 1, Precincts 1 and 3, I pledge to be a strong, independent voice on behalf of our diverse community’s needs and aspirations, as well as on town-wide issues of shared concern. For more than thirty years, my family has lived in North Amherst surrounded by farmland, forests, hiking trails, and Puffer’s Pond as well as a vibrant and diverse community of neighbors. District One has a wealth of resources: our own Post Office, the oldest library in Amherst, innovative co-housing communities, numerous farms including the newly opened Simple Gifts farm store, the Amherst Survival Center, the Fisher Hospice, the Renaissance and Holocaust Centers, the Black Walnut Inn, the Harp and other eating establishments, the Mill River Recreation center and the soon-to-open North Square/Mill District. We also face challenges. North Amherst is one of the lowest income areas of Amherst, qualifying as a Federal Opportunity Zone due to incomes below town and state averages and high rates of poverty. And we are home to a large number of students living in multiple apartment complexes who are not well integrated into the broader community. During numerous neighborhood gatherings I have attended, community members have emphasized a number of concerns. Positive Development: We need to assure that economic development aligns with the quality of community life in North Amherst and preserves our natural resource assets. Development in our village center will increase traffic and use of Mill River, Puffer’s Pond and other outdoor resources. This requires action to address long-time concerns about roads, sidewalks, bike trails, and traffic speed. Getting Around Safely: We need to fix roads, add and repair sidewalks and cross-walks at key intersections, improve bike lanes, put speed bumps on busy cross streets with children and lower speed limits on Montague Road and East Pleasant to assure safety. Traffic concerns intensify when UMass is in session. With the North Square opening in 2019, there is an urgent need to find a solution to the traffic flow and safety at the intersection by the North Amherst library. 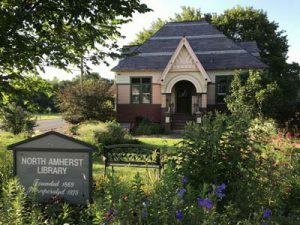 North Amherst Library: As plans to improve the intersection at the center of North Amherst materialize, the future of the North Amherst Library may come into question. I pledge to preserve the Library, because it is a significant community center, one that brings persons of all ages together. Innovative Farms: Farms provide North Amherst and all of Amherst with a source of fresh local produce and dairy products. Sustaining farms will require understanding the spillover impact of developments in adjacent areas. Many farmers have land committed to preservation in agricultural trusts. Looking forward, policies will need to enable the co-existence of farms and the district’s expanding population. If elected, I will work with community members to identify actions that will enhance the vibrancy and diversity of District 1 and continue to make it such a special place to live.